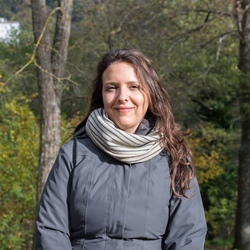 Luciana Squadrilli introduces the thirteen most traditional and delicious pasta dishes found throughout Italy, including some well known classics and a few hardly heard of outside the country. When it comes to pasta, Italy is unrivalled beyond doubt. 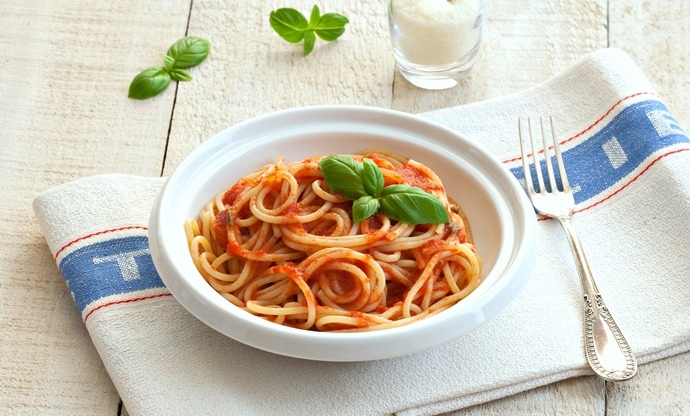 As the world's biggest producers and consumers – approximately twenty-five kilos per person every year, unexpectedly followed by Tunisians – Italians are probably the only people happy to eat pasta more than once every day. Always considered (and cooked) as a course on its own and not as a basic carbohydrate to accompany meals as a side dish, pasta – served after entrées and before meat or fish courses – is yet another delicious example of typical Italian inventiveness. With over 300 different shapes (formati) – from the most common ones such as spaghetti and rigatoni, to the oddly-named regional varieties of freshly made pasta – and a virtually endless number of possible combinations of ingredients to create both simple or elaborate sauces, there’s never a dull dish. 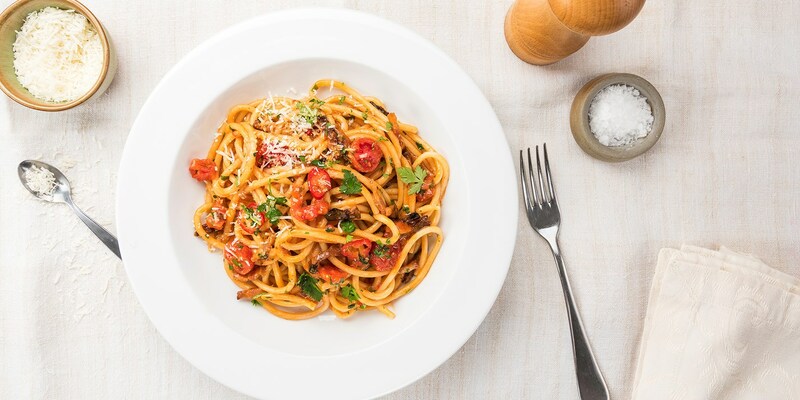 Here’s a quick overview of Italy's most popular traditional pasta dishes which have stood the test of time, plus our top pasta recipes so you can cook them at home. This is a classic ‘empty larder’ recipe, but by using a generous amount of great quality extra virgin olive oil, you can achieve a highly satisfying result. 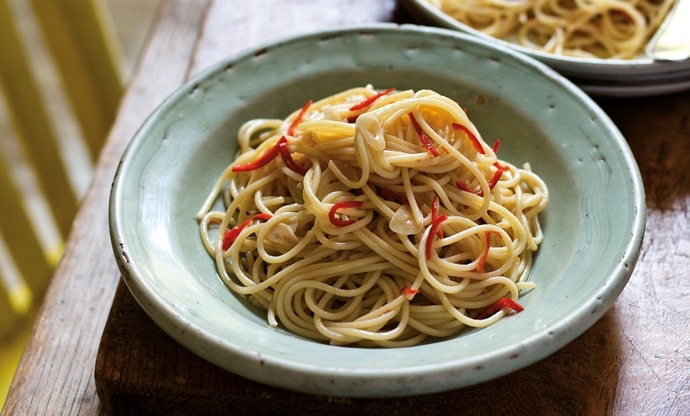 Let the garlic gently turn golden brown simmering in a pan with the oil, add the desired amount of chilli and season the cooked and drained spaghetti with the flavoured oil, removing the garlic. Once on the plate, you can add a sprinkle of parsley. If you ask an Italian chef which single recipe is best at evaluating a cook's skills, they will tell you spaghetti al pomodoro. The secret is using fresh and tasty sun-ripened tomatoes without overcooking them, or very good quality tinned peeled tomatoes, a little bit of garlic and fresh basil leaves to give scent during cooking. Put a fresh basil leaf on the top of the finished dish for an additional Mediterranean touch. This is northern Italy's response to spaghetti al pomodoro; the typical, not-too-thin egg pasta is seasoned with a rich, slowly-cooked tomato sauce (with or without meat; in the former case you would call it a ‘quick ragù’) and flavoured with a generous amount of freshly grated Parmesan or Grana Padano cheese. 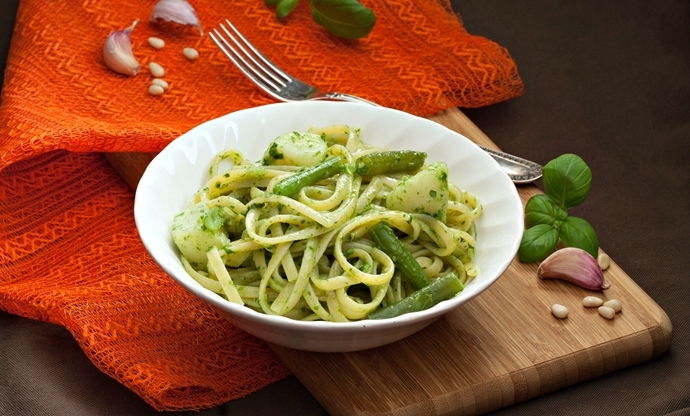 Are you comfortable with the idea of eating green pasta? Don't worry – the colour is completely natural, coming from the creamy mix of fresh basil leaves (PDO-protected Genovese basil if possible, since the original recipe is from Liguria and its aroma is unique), garlic, coarse salt, pine nuts, grated Pecorino and Parmesan with a drizzle of delicate extra virgin olive oil. The original recipe requires gentle grinding with a pestle and mortar so as not to ‘heat’ the raw ingredients. Pesto sauce is usually used to season long pasta such as spaghetti or trenette (similar to spaghetti but with an elliptical instead of round shape) or with short pasta such as trofie. A local version also includes potatoes and green beans. Another delicious ‘last minute’ recipe, very common in Naples and Southern Italy, especially during summer when the tomatoes are amazingly tasty and the weather too hot to spend long hours in the kitchen. 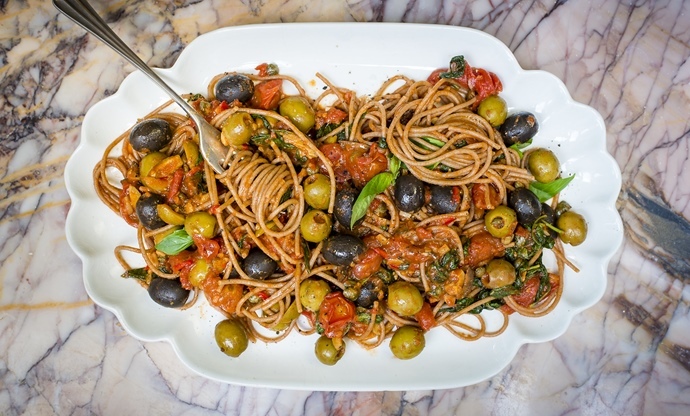 Basically a richer version of spaghetti al pomodoro, puttanesca also includes capers, oregano and the delicious black Gaeta olives, which give the dish its unique, savoury taste. Some more modern recipes also include anchovies and chilli. The curious name – which is an Italian word for prostitute – is said to refer to the fact that it was a popular dish in Neapolitan brothels. If tomatoes are the staple of Naples and Southern Italian cooking, Pecorino cheese and guanciale (cured pork made from pig cheek) are the staples in Rome. Starting from these two intensely tasty ingredients, a number of delicious pasta recipes were born. 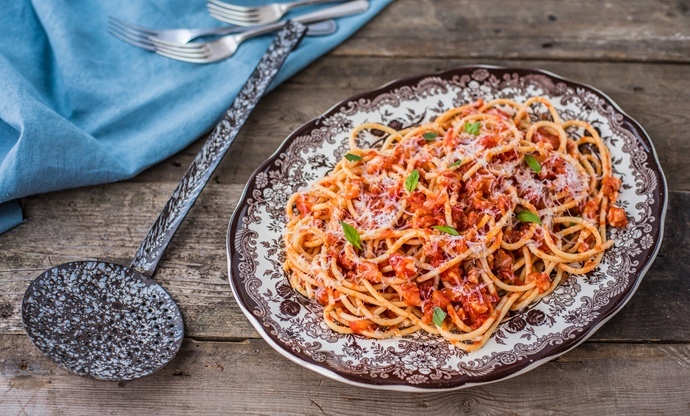 One of these is amatriciana – many Italians still quarrel about how to name it, with or without the initial ‘a’ (matriciana), but the name clearly refers to the mountain village of Amatrice, where the best guanciale comes from. It is one of the most popular Roman recipes; a rich and flavourful pasta dish made with tomato sauce, small crunchy guanciale chunks and plenty of grated Pecorino cheese. 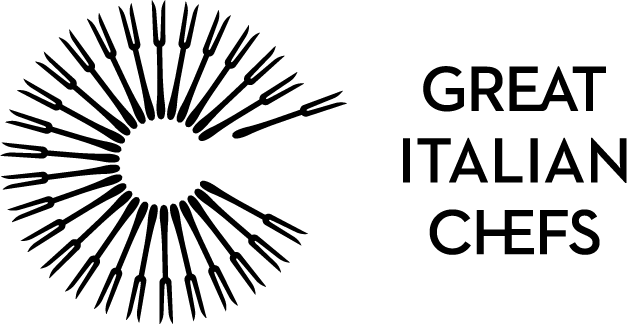 An older version of the recipe called gricia, still very popular in Rome's restaurants, did not include tomato, and adding other ingredients such as garlic or onion would result in fierce resentment from any proper Italian foodie. Amatriciana sauce can go both with long (spaghetti or the thicker bucatini, with a hole – buco – running through the centre) and short pasta, namely rigatoni (ridged pasta can better hold the sauce). In 2008, Italy issued a special stamp dedicated to amatriciana. Another unmissable Roman classic: in this case, egg yolk (some also use a small quantity of egg white) is the main ingredient, together with the ‘usual’ guanciale (some prefer bacon) and Pecorino cheese, sometimes mixed with Parmesan. Absolutely no cream or milk is added, according to the original recipe. The result should be a creamy, smooth and rich yellow sauce with the pork lending a nice crispy texture. It’s easier said than done to get the right balance between egg yolk and white (if used), and you need to be fast when adding the egg and cheese mix to the cooked pasta when it is still very hot so the sauce will ‘cook’ without curdling. 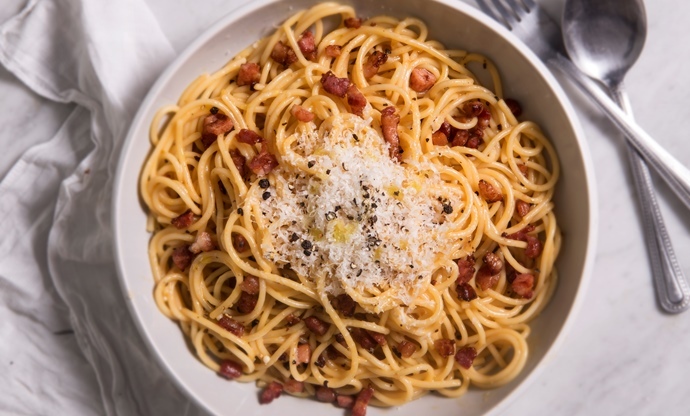 Carbonara is usually made with spaghetti, rigatoni or penne, and its origins are uncertain: the name could refer to the Carbonari (‘charcoal men’, also the name of a secret society), but according to a popular opinion it could have been invented in Rome in 1944 by US soldiers with a craving for their beloved eggs and bacon breakfast after the allied liberation of the city. Literally meaning ‘cheese and pepper’, this popular Roman recipe basically features the two ingredients – black pepper and Pecorino cheese – and nothing else, besides pasta. Once again, ‘simple’ does not mean ‘easy’; the aim is to obtain a delicious and creamy sauce by skilfully mixing the grated cheese (and ground pepper) with the hot, drained pasta, stirring until it perfectly melts. It’s vital to add some of the pasta’s hot cooking water, which is rich in starch, to the dish to soften the cheese. 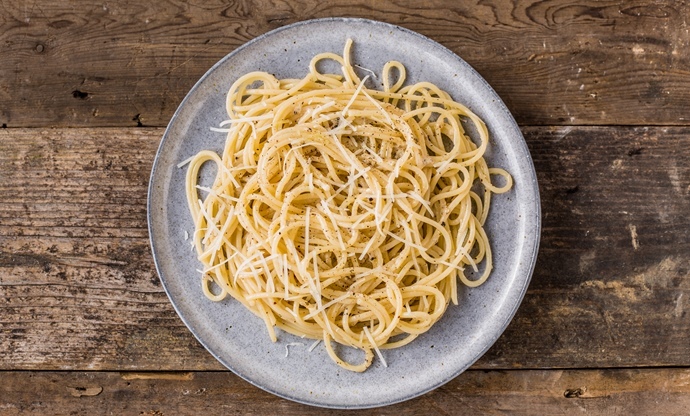 Preparing a perfect cacio e pepe is an art only a few can truly master. This could be confusing: Genovese sauce bears the name of the northern Italian city of Genoa, but the irresistible scent of this dish – for those who love onions, at least – is from Naples in the south. Both the name and the recipe could have actually originated in Genoa, introduced to Naples by the sailors coming from Liguria. 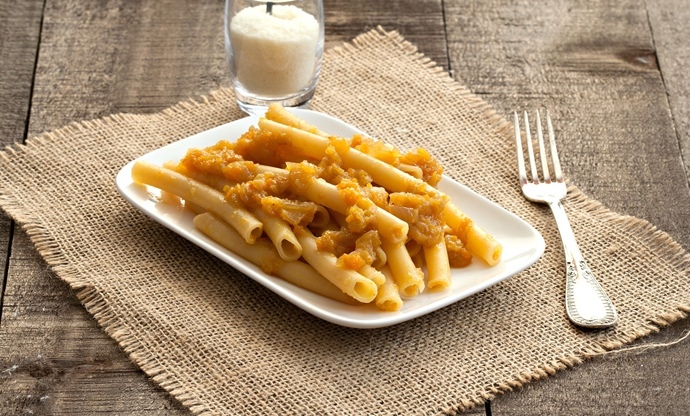 Today though, there is no trace of a similar dish in Genoa, while pasta alla Genovese is a key feature of a Neapolitan Sunday lunch, when breaking the handmade ziti – long tubes of pasta resembling large macaroni which have to be cut into smaller pieces to cook and eat – is part of local tradition. The rich, onion-based sauce is slowly-cooked for hours, together with minced carrots and celery, chunks of meat and pieces of lard. The final result is a thick, creamy sauce, where the onions have completely melted and the meat is soft and easily pulled apart. Grated Parmesan or Pecorino is often sprinkled over the pasta, and the pink sweet onions found growing in Campania are perfect for cooking this particular dish. The ubiquitous word found in many Italian menus from north to south, comes from the French term ragôut and generally refers to every kind of long-cooked, meat-based sauce. 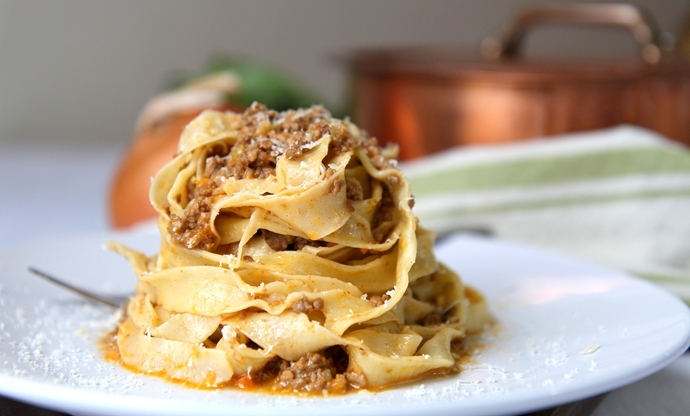 The two main versions of authentic, proper ragù, though, are from Naples and Emilia-Romagna. Neapolitan ragù is a rich, intense red sauce obtained by the slow, extremely long simmering of tomato sauce with soffritto (the Italian version of mirepoix, made of finely chopped onion, parsley and celery), basil and big pieces of mixed meat which, once cooked, are served as a main course after pasta. A real symbol of Neapolitan cooking, ragù is the alternative to pasta alla Genovese for Sunday dinner. The Bolognese version uses finely chopped or even ground meat, a lesser quantity of tomato and onion and includes white or red wine. Sometimes lard, milk and offal is added, too. 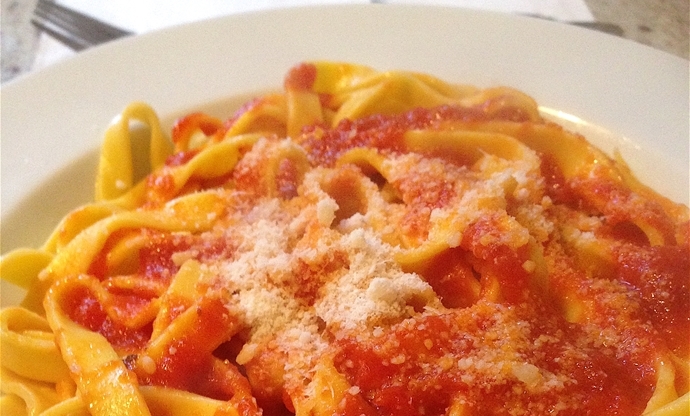 The result is a creamy or grainy pale red sauce usually used with fresh egg pasta such as tagliatelle or fettuccine. A staple of southern Italian summer meals and very popular along the coast of the country, this dish is best enjoyed whilst looking out over the sea. 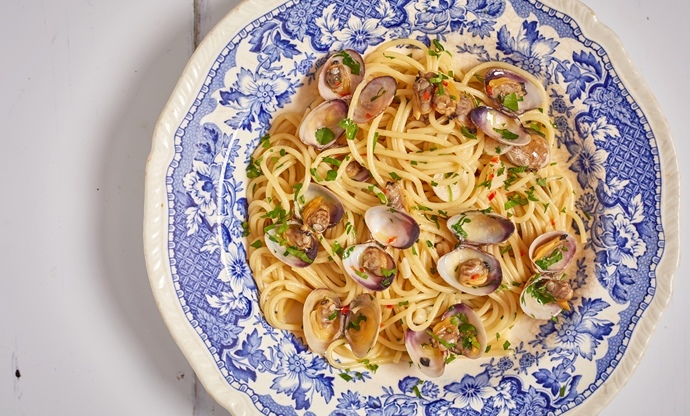 A basic aglio e olio (garlic and oil) sauce – with a bit of chilli if preferred – is cooked in a huge pan, before lots of clams are added and sautéed until they open and flavour the sauce. Vongole veraci (carpet shell clams) are the best variety for this dish. 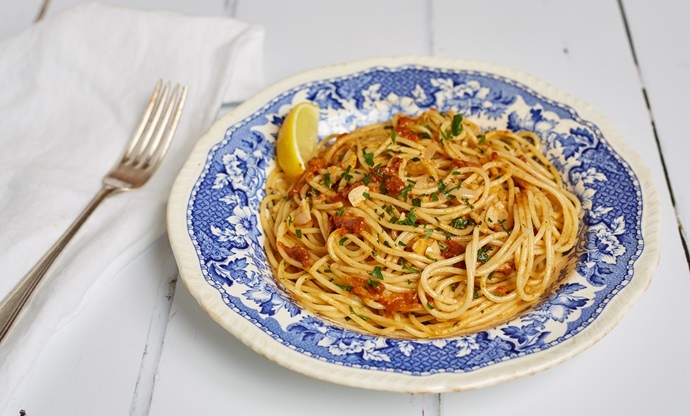 Once the pasta – usually spaghetti and always a long variety – is cooked and drained, it is added to the clam sauce and quickly mixed in with finely chopped parsley. Some prefer a slippery, oily sauce while others prefer something creamier which ‘wraps’ around the spaghetti, using the pasta's natural starch. A tomato-based version of the same recipe is common, too. Made in the same way as spaghetti con le vongole, using the sweet orange pulp (basically, the roe) of sea urchins, this dish is most popular in Puglia. Some use cream but it completely spoils the flavour of the urchins. The pulp should be freshly extracted from the shells and added at the very end, quickly cooking the pasta with the sauce until it melts and forms a delicate cream, resulting in an unusual yet delicious experience. 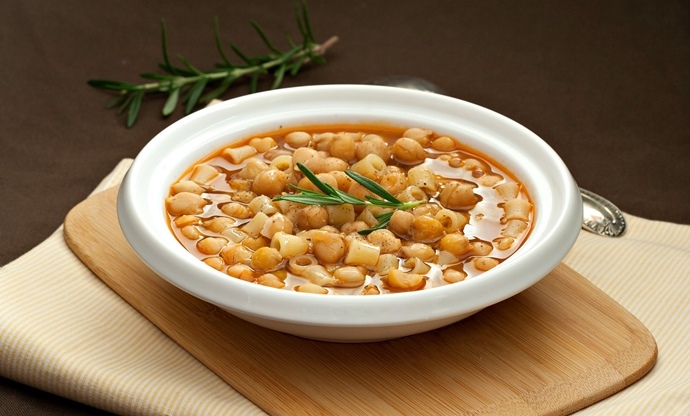 Belonging to the Italian tradition of minestre – dishes made by cooking pasta in a sort of broth together with other ingredients such as vegetables, potatoes or beans – this combination of chickpeas and pasta is a simple, delicious, warming and deeply satisfying recipe. The secret lays in using good quality soaked dried chickpeas, an intense extra virgin olive oil and a sprig of rosemary for added flavour. Usually short pasta or broken spaghetti is used for minestre, and while northern Italians usually eat it with more liquid, in southern Italy a thicker, creamier version is preferred, obtained by blending some of the legumes and slowly cooking the pasta with a small amount of water or broth until half-cooked and letting it rest for a short time.